Ayesha Dean is back with another mystery to resolve in The Seville Secret and our bookstore is excited to get an interview with the author. Q1- Did you have to go on a literary pilgrimage for this second tome? A1- Yes! Just like I drew on my visit to Istanbul with The Istanbul Intrigue, I did the same with some scenes in The Seville Secret, although I went there many years ago. The first time I visited Seville and Cordoba, I loved Andalusia so much that I found myself back there again a few years later, but I added Granada, Madrid, and Barcelona to our itinerary as well as returning to Seville and Cordoba. Making those trips and seeing so many sights of historical significance to Muslim rule in Andalusia touched me deeply. It felt amazing to walk the halls and passages of our ancient brethren and to imagine what life would have been like in the ‘Golden Age’ of Islam when the pursuit of knowledge in the arts, philosophy, spirituality, medicine, architecture, music, astrology, and beyond was celebrated and encouraged. It was also an excellent reminder of the temporariness of worldly power and how things can change very quickly in a relatively short space of time. Q2- I loved the story as it shares a lost Islamic history in a non-preachy way. Additionally, I felt like the story had a very platonic romantic vibe; something I appreciated and it’s something that’s rarely done in YA these days. Everybody is dating in almost all YA books. Was the vibe I felt in Ayesha Dean II intentional for the young adult crowd? A2- Yes, with respect to the innocent romance. Even though Ayesha Dean and her friends are older teens, I’m conscious of the book being directed at middle-graders, so I didn’t want the love aspect to play too much of a role. ‘Love’ as a pre-teen can be a new and exciting concept, but I think the majority of parents who buy books for their children agree that any ‘love scenes’ should be PG-rated for a children’s book. Q3- How do you define success in the writing industry? A3- Success means so many different things to different people. Even within myself, I have different ‘levels’ of success for different aspects of my writing. The writing industry is so wide that it would be difficult to provide an unqualified answer (that’s probably the lawyer in me speaking). I feel like I have achieved some success in writing and publishing a book series that has made a lot of young people happy to see that someone they can relate to is represented in a story book. I’ve written stories that I would have loved reading as a Muslim child growing up as a minority. The positive feedback I’ve received from teachers, parents and children has been an absolute pleasure to behold. But does that mean I think I’ve written a literary masterpiece? No way! In the writing aspect I know I have much to learn. I feel like my writing has improved with the second book, and I fully intend to keep improving as I go along. Q4- How do you deal with good and bad reviews? A4- Good reviews are always a pleasure to read! Bad reviews are infinitely less pleasurable. Once I get over the initial hurt of a bad review, I try to approach it with an open mind. I do my best to take constructive criticism on board. But if the criticism isn’t constructive, I try my best to put it out of my mind. I know different things appeal to different people. You can’t always please everyone in life! Q5- What do you want your readers to take away from this book? A5- As our world becomes more globalized, and people of all cultures are becoming more integrated in society, I think it’s crucial that more diversity is represented in the books we read. It’s important for Muslims to also be represented among the thousands of heroines or heroes available in children’s literature. I hope that Ayesha Dean can teach children a little bit about Muslims and Islam, and from the resulting familiarity and empathy, both Muslim and non-Muslim kids can benefit by learning more about the world around them. Melati, thank you for being with us. Readers, please check out the review of Ayesha Dean – The Seville Secret below. Ayesha Dean — The Seville Secret is the next tome in the cozy mystery series of Australian author Melati Lum. Ayesha, Sara and Jess are back in an exciting new adventure, and this time they’re off to Spain! When a fellow passenger’s beloved grandpa strangely disappears, Ayesha and her friends gladly join in the search for the missing person. But as Ayesha delves further into the mystery, the more sinister the stakes become! Ayesha finds a link between the missing person and a 16th century diary that contains clues to an ancient mystery. However, each step closer to discovery seems to pose greater chances of peril. Can Ayesha uncover the truth without putting herself and her friends in mortal danger? Like Ayesha Dean – The Istanbul Intrigue , book two is also a pleasantly fast read. Ayesha and her friends Sara and Jessica befriend a young man whose grandpa is in trouble. Once in Spain, the girls lend the young man some help to resolve the mystery surrounding his family. This leads them to admire and discover the landmarks in the cities they sight-see, witness the culture and most importantly for me, savor the local food! I happily made Churros while reading this book, and you won’t regret doing the same as it was a good reading companion. In Ayesha Dean — The Seville Secret, Ayesha upgrades her sleuthing skills. We also find out that Dean can be an Imam and an Accountant with a penchant for the right kind of asceticism. Furthermore, she is a good ambassador of Islam. This is demonstrated by her nice manners such as her willingness to help anyone who asks to pitch in. Dean’s subtle devotion to her faith is a great plus. Thus, her non-Muslim uncle and friends Sara and Jessica have no issue with Islam. Now, because Ayesha is still young, her uncle doesn’t completely appreciate the fact that she puts the lot of them in danger, and we can understand his concerns. She is dealing once again with unsavory gangsters. Ayesha reassures him to be more careful and takes the necessary precautions to avoid causing harm to herself and her friends. From devouring delicious Spanish food, uncovering sad and loving family histories and ancestries, evading and exposing dangerous treasure seekers to making appropriate and exciting friendships, this is the book you want your teenager to read in an overly materialistic society. 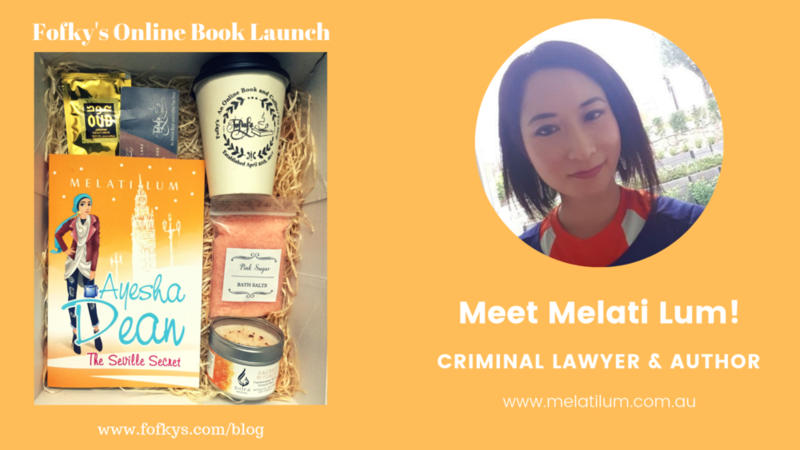 You can find out about Melati Lum on her website www.melatilum.com.au. To end, I highly recommend Ayesha Dean — The Seville Secret to the teen in you and around you who fancy cool and exciting Middle Grade and YA books. This is one of the I Can Series of books that introduces and illustrates some basic yet important concepts and terms for young Muslim children. These are explained with reference to their everyday life and in the settings with which children are familiar. In simple, easy-to-understand language the series presents Islam as a living reality to be experienced in daily life. It answers many questions about Islam as faith which arise in the young, curious minds. For ages 3-5 years and the young at heart. How do we learn to remember Allah when we start to do something? We say "bismillah" when we wake up, wash, dress, play, or eat to remember our Creator and thank him. Our Thoughts: I Can Say Bismillah Anywhere is about 15 pages and it will help children young children get in the habit of saying "bismillah" before any activity. They will come to feel empowered by it and not feel shame insha'Allah. In our opinion, I Can Say Bismillah Anywhere will aid children recognize the basmala in Arabic anywhere as well. It's a great teaching resource for Muslim families. You can get a copy on Amazon or at Kube Publishing. To get 10% off any book at Kube Publishing's website use COUPON CODE : BLOGGERS10 . Read the review of I Can Wear Hijab Anywhere on my blog here. Summary : This book aims to introduce the Arabic alphabet to non-Arabic-speaking children age 3 – 6. It uses animal theme with 28 coloring pages for the 28 letters of the Arabic alphabet. We enjoyed coloring outside the lines too. It was a fun activity. When the kiddo starts talking, we will revisit it for sure as a teaching Arabic aid. When I Grow Up by Sundus Iraq is a children’s book that has become my favorite! Why? Because it has Arabic writings. It’s perfect to instill the language to children. Arabic seeds indeed I’ll keep iA. The Author Sundus Iraq is also the Illustrator. This preschooler’s book teaches our children to dare to dream to become or do anything they put their minds to. The book is realistic because I remembered my son who doesn’t speak English yet wanting to be very independent and do the same we do. For instance, he wants to drink in regular glasses and use normal spoons instead of children’s eating ware. I drew parallels with my son and the protagonist of When I Grow Upand smiled cheerfully. You can get your copy on Amazon or the publisher’s website along with other wonderful children’s books. Now, here is a sneak page. Lovely isn’t? Summary: When Naiya wakes up to her busy, loud surroundings, she decides to escape into nature! In this book, Naiya teaches you seven beginner yoga poses, to breathe and, most importantly, to smile! Naiya in Nature is a children's book that I enjoyed reading with my son. It awoke the child in me as I love nature and peace of mind. We dusted off my yoga mat and we attempted to do yoga as mother and son. It was a bonding activity for sure alhamdullilah. Naiya in Nature is about 24 pages and the drawings are absolutely beautiful and cute masha'Allah. The text is also easy to read. As we read, we also realize that not only us, parents, get stressed from our surrounding due to our daily responsibilities. Children also do and they need an outlet to stay happy children. And Naiya the main character of the book overcomes her unwelcomed feelings by loosing herself in nature and practicing easy yoga moves. I recommend Naiya in Nature to both parents and children alike because yoga is a fun relaxing activity. Get your copy on Amazon here or on the Author's website. P.S. You can read more on Yoga and Islam here. Say "Alhamdulillaah!" by Umm Khadiijah Al Liybeeriyyah is a children's book that Muslim children need to remind them of the sunnah habit of saying "Alhamdulillaah" when finishing tasks, eating or anything else they're supposed to give thanks for on a daily basis. It's the first book in the series, and I found it cute and concise. Say "Alhamdulillaah!" is about 19 pages and the texts are easy to read. I also like that the pictures are faceless. It's aimed at 3 to 8 years old. Insha'Allah, my son will get the chance to read it on his own one day. You can get your copy by ordering a copy on Umm Khadiijah's website. You can also follow her at her blog or on Twitter. Let's help Umm Khadiijah Al Liybeeriyyah with her dawah efforts by sharing insha'Allah.